The first job of any sports logo is to identify. Yes, it needs to look cool and work on the side of a helmet. But first and foremost, a logo needs to be unique. It needs to signal that this team is different from that team, and when you see this logo it means they’re awesome you should join their tribe. The fancy Branding 101 term is differentiation. Starbucks looks different from Dunkin’ Donuts, Apple looks different from Microsoft, etc. You want to look different in order to stand out in a crowded marketplace. Differentiation applies to the education market as well. “Joining our tribe” means “enrollment.” As a unique identifier, an athletics logo should help draw your audience into an enrollment conversation. Now, I get it. 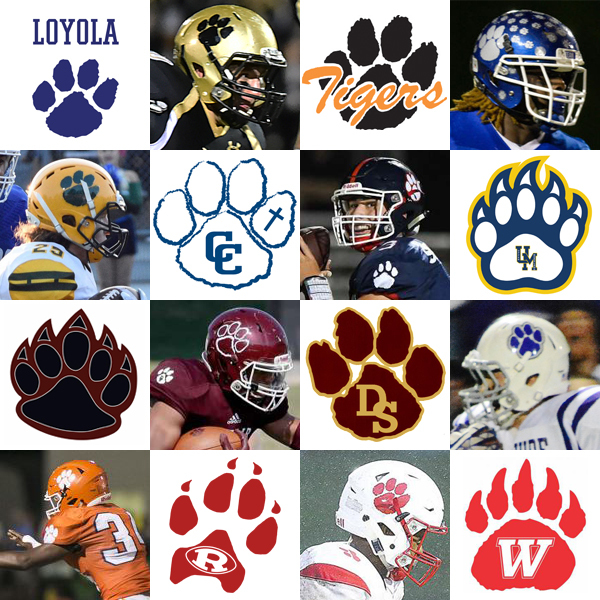 For a lot of schools, the paw is the easiest, most accessible solution to a “Holy smokes we need a logo!” problem. For the short term, it gets the job done. But in an enrollment-driven world, every marketing asset needs to help drive the bus. Because the paw idea is used by primary schools all the way up to colleges, it’s overused, ubiquitous, and not unique. For schools needing a paw problem solution, the answer is in your brand story. Emphasizing your story’s uniqueness will produce a more unique athletics logo, better identify you as awesome, and get more people on your enrollment bus. To be uniquely identified, you must be different. To be different, you need a bold brand story. What’s the bold story your school needs to tell?